Hello from Ohio looks like a common first post! Honestly, I'm a few years out from getting a Tamaskan. I found and fell in love with the breed about six months ago, and have been poking around breeders' site since, just to get a feel of what I (will hopefully eventually) get myself into. I'm a med student, so it will be a little while until time/money/space allows me to get a Tamaskan. Once I'm all settled into my residency, I should have all of those. But, in the meantime, I like doing research on them, and joining the forum seemed like a great way to do so! 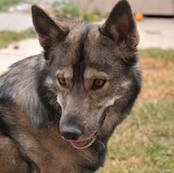 I'm pleased to meet ANYONE with genuine interest in the Tamaskan breed. May your quest, however long, be rewarded and if you are lucky enough to have a Tam in your life, may your dog bless your life the way my Kona has blessed mine! I know there's a serious Tamaskan fan between Dayton and Cincinnati, and a number of wonderful dog people in the state. P.S. Since Ohio is a pretty big place, (and you don't have to answer this) an idea of what part of Ohio would satisfy some personal curiousity. Thanks guys! I'm so excited to continue learning about the Tamaskan! I'm actually from Toledo--about as far away from Dayton and Cincinnati as you can be!